Regulation Update: Effective Jan 21, 2014 by Alberta Transportation Jan 26, 2014 On January 21, 2014 Alberta Transportation released a new update to the Sign Panel Catalogue. Please note the following updates: Alberta Transportati..
Traffic Control Person Ahead Sign is the new standard signage to be posted when flaggers are required in the work zone. Most people know the traditional 'flag person' sign however 'Flag Person Ahead' was made obsolete in the Alberta Transportation Sign Library as of January 2014. 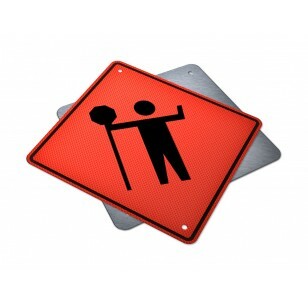 This Traffic Control Person Sign supersedes 'Flag Person Ahead' and it depicts a person holding a Stop/Slow paddle as the pictogrom. Traffic Control Person Ahead Sign is an Advance Warning that workers are present on the jobsite and should expect to encounter a worker holding a stop/slow paddle dressed in HiViz Yellow-Green coveralls. This new sign more accurately represent the current traffic control person in work zones. 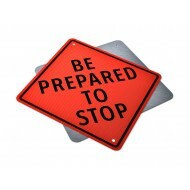 This sign also meets the most current material specifications and is sheeted in the highest visibility, Type XI reflective fluorescent work zone orange sheeting for maximum visibility night or day. The most common mounting is on an A-Frame Sign Stand or a U-Channel Post. You might also be interested in professional Stop/Slow paddles for your work zone. 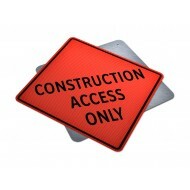 If you are operating a temporary work zone you can Rent Traffic Signs & Traffic Controls instead of purchasing, potentially saving you a great deal of money on your job. Purpose: Advance Warning Area begins at the first advance warning sign "Be Prepared To Sto..
Purpose: Flag Person Ahead Sign had been discontinued as per government regulations .. 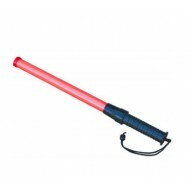 Specifications: Can perform Flashing and Steadyburn functions Bulb Type: LED ..